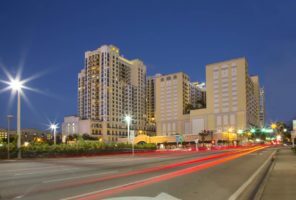 Situated in downtown West Palm Beach, this urban mixed use facility stands 21 stories tall and features 467 condominiums, an 8 level 650 space garage, street level retail, rooftop pool, and 9th level amenities consisting of fitness, spa, lounge and theater. High speed elevators, key fob security access and smart wiring for temperature and lighting are among the building’s featured amenities. Built on a two acre parcel of land, and surrounded by occupied commercial buildings, required field crews, which grew to over 350 during the peak of construction, to carefully orchestrate each aspect of the $142.8 million project. 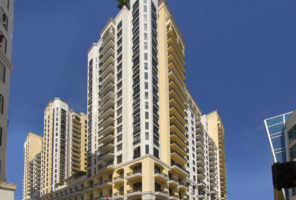 The structure, which is supported by auger cast piles and pile caps, includes cast-in-place concrete with post tensioned decks, block infill and stucco; floor-to- ceiling height sliders, punched operable windows and aluminum railed balconies. As construction manager, Craft worked through a 5 months of preconstruction providing cost, schedule and logistical analysis at specified design intervals and assisted with the permit and approval process before garaunteeing a final GMP and commencing construction. All work was completed safely, on time and in budget while minimizing impact to the community. Members of Craft built the adjacent One City Plaza, a $65 million, 16 story, 350 unit residential tower.